After the grisly massacre at Stoneman Douglas High School in Florida, the conversation surrounding gun rights has once again been reignited. The same debate occurred after Sandy Hook, after the Pulse nightclub shooting, and after the Vegas shooting at Mandalay Bay. It will happen again, inevitably, when another major mass shooting happens on American soil, which probability suggests and recent memory all but affirms. Central to this reiterative debate over possible gun control is gun rights’ proponents ostensible silver bullet, their trump card: the Second Amendment. 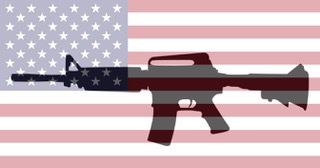 The Amendment is invoked with a type of religious fervor, with an absolute certainty that unlimited American gun ownership is and has always been an inviolable Truth. However, a close analysis of the actual text immediately dispels this notion. Here is what the Second Amendment says: "A well regulated Militia, being necessary to the security of a free State, the right of the people to keep and bear Arms, shall not be infringed." Let’s unpack this pivotal sentence, clause by clause. First, what exactly is a “well regulated Militia?” The Oxford English Dictionary defines “militia” as “a military force raised from the civilian population of a country or region, esp. to supplement a regular army in an emergency.” Ratified in 1789, shortly after the American victory in the Revolutionary War, it is no wonder why this clause was written. Local militias were key to supplementing the Continental Army in their battle against British troops. Nowadays, the only remaining militia is the U.S. National Guard. Obviously, we no longer rely on ragtag militias for national defense, as we boast the most powerful and well-funded national military on the planet. I think it’s safe to say that a militia, in any sense of the word, is no longer “necessary to the security of a free State,” rendering the first half of the amendment moot. One argument that gun advocates often raise is that their guns are necessary as a safeguard against a doomsday scenario in which the federal government assumes totalitarian control over the people. Perhaps anti-Federalists, skeptical of the Framers’ proposal of a centralized and far-reaching federal authority, pushed this amendment with that in mind. Yet, in 2018, this argument is absurd. No gun, no assault rifle––no matter how powerful––could stand up to the awesome force of our military. If push ever came to shove in a 1984-esque government takeover, no amount of AR-15s could outpower the government’s tanks, drones, bombs, and whatever electronic weapons are being developed in the basement of the Pentagon. Finally, let’s look at the clause that the NRA time and again points to, often out of the context of the full sentence of the amendment. The federal government cannot infringe upon “the right of the people to keep and bear Arms.” Even this clause, on its own, is not a categorical guarantee of everyone’s right to own a gun. In a linguistic dissection of the Second Amendment by University of Illinois Professor Dennis Baron, he states that the phrase “Bear arms (analogous to, and perhaps initially a translation of, the Latin arma fero, or arma ferre) typically refers to the act of soldiering and the use of military weapons.” This definition of bearing arms is consistent with the first half of the amendment, which explicitly states that the purpose of said right is in the context of a defensive militia. In fact, the idea of an incontrovertible individual right to gun ownership was only established recently in the 2008 Supreme Court case District of Columbia vs. Heller. In the split 5–4 ruling, the affirming justices offered a generously broad interpretation of the right to bear arms, arguing that the “Well regulated militia” clause was merely preambulatory. I, however, doubt that James Madison, who penned the Bill of Rights, chose his words so lightly that half a sentence could be erased and still retain their full meaning. It’s also worth noting that the Constitution is not a holy or unalterable document. It was designed to be modified as necessary, and has been amended 27 times since its ratification. The original text tacitly sanctioned the institution of slavery, defining a slave––as we all know from fifth grade social studies––as three-fifths of a person for census purposes and as property for all other purposes. The Framers of our burgeoning nation did not reflect the demographic makeup of our country. Furthermore, the meanings of words and phrases change, a reminder that language is not fixed but is constantly in flux, changing with our culture. “Militia” is a term seldom heard today, and “Arms” such as high-power assault rifles are certainly not the same as the unreliable, inefficient muskets employed by American revolutionary forces. We can argue ad nauseam about the actual intentions of our nation’s founders in crafting the defining text of our political system. Or, instead, over two centuries later, we can return to a common sense conversation about who should be allowed guns and what guns everyday citizens should be able to own. Polls show, as they have in the wake of most mass shootings, an overwhelming consensus for more stringent background checks and banning high-capacity magazines. The conversation is only made more difficult by the false notion of an unlimited, sanctified right of personal gun ownership in America. Words matter, whether it’s the actual letter of the law or the speeches made by the courageous survivors of the Parkland shooting, who have proclaimed in frustration, for all the nation to hear: we call BS.